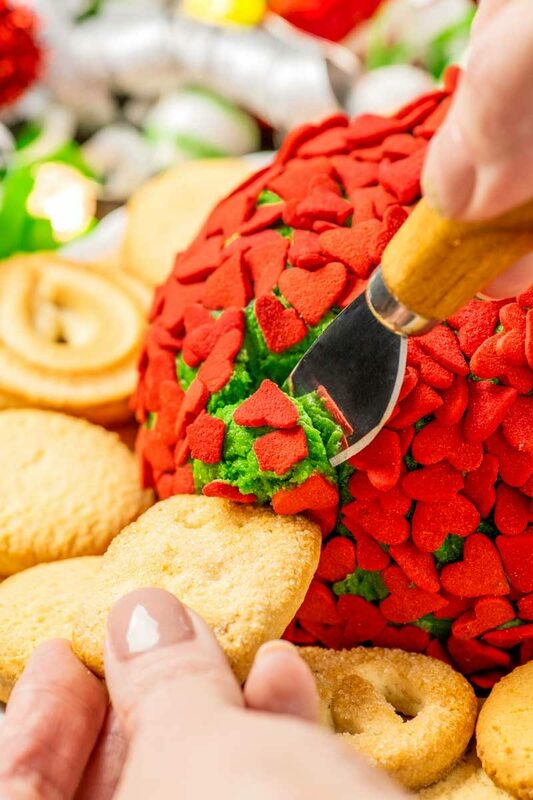 Perfect for the holidays, this Grinch-themed cheese ball has a green hue and is covered in tiny heart-shaped sprinkles. 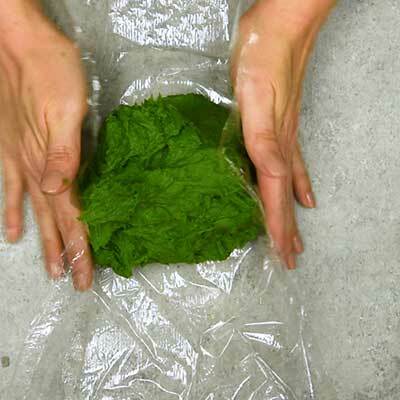 Plus, it can be made different flavors! 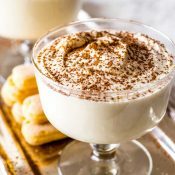 If you’re on the hunt for a unique appetizer (or dessert!) 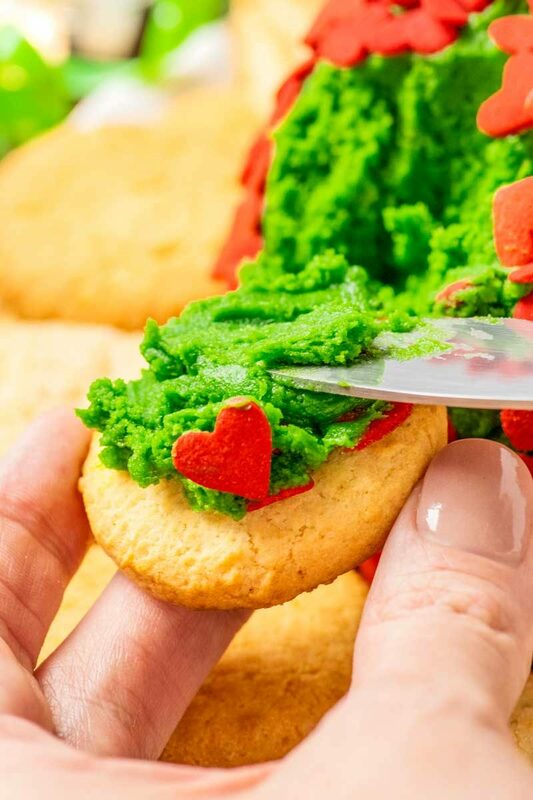 to serve at your next holiday party, look no further than this Grinch cheese ball. 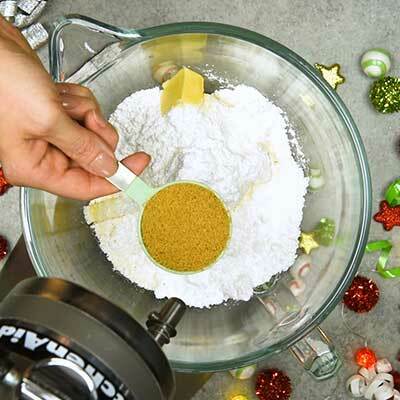 Between the festive colors and the sweet taste, it’s bound to be a hit, even for those whose hearts are too small. What color green should be used? 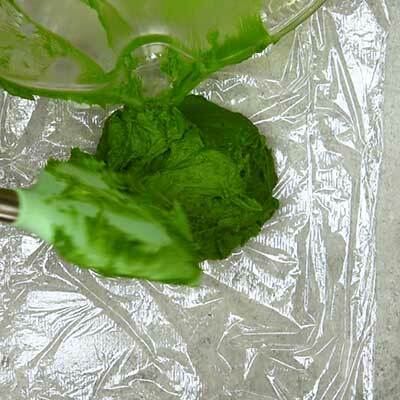 For this recipe, I chose to use a color paste (for consistency and vibrancy) and the color I went with was Moss Green. This seemed to be a more “Grinchy” fit than other festive colors out there like Leaf Green. If you’d like a more pastel green, Kelly Green (with maybe a touch of yellow added) is also a good choice. Where can you get heart sprinkles? It can be tough to find heart sprinkles in the winter, but I located a couple bottles at a local craft store (specifically at Michaels). What to eat with a sweet cheese ball? Feel free to try one (or many!) of these with this festive cheese ball. 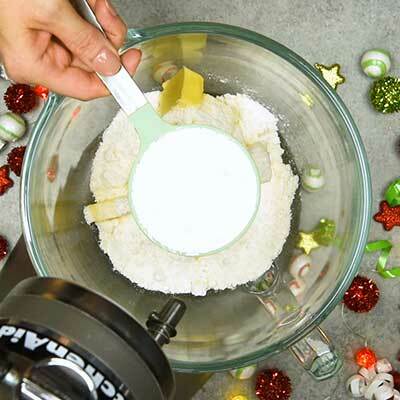 What flavor cake mix can you use? That the color of the baked cake would be white or pale in color. Dry cake mix always looks lighter than what the baked cake will be, so be sure to judge the color by the picture on the cake mix box. 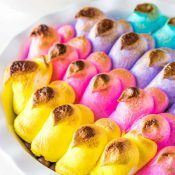 The wet ingredients in this recipe will turn the batter that color (and maybe even a little darker for some flavors). That the flavor you’ve chosen will taste good with sweetened cream cheese. 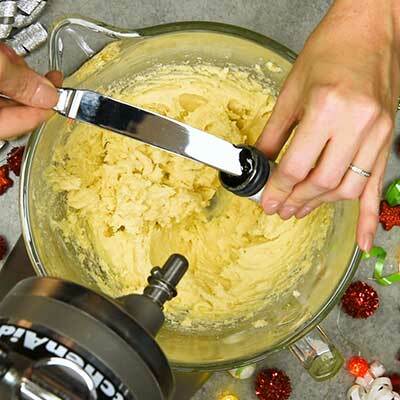 A general rule of thumb is that if the flavor sounds yummy as frosting then it’ll also be good as a sweet cheese ball. For most foods, the general rule of thumb is that a perishable item should not be in the “danger zone” for more than two hours. And by “danger zone”, this is usually at or just above room temperature. This cheeseball will still be a little chilled when served, and this should give you an extra 30 minutes beyond the two-hour window, depending on the temperature of the room and how long ago the cheese ball left the refrigerator. 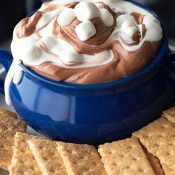 One of the most common questions I get about dips and cheeseballs is whether or not you can make them in advance. I totally understand why someone would want to do this, as it’s easier to prepare treats for a party the night before than scrambling to get everything done the day of the event. And the good news here is that yes, you totally can! Cheese balls are ideal for making in advance. 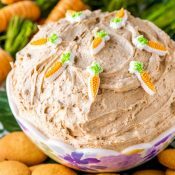 You can either make the cheese ball and wait to cover it in sprinkles before serving (this is ideal, just so the sprinkles stay pretty) OR you can fully prepare the cheese ball, sprinkles and all, and store it in the refrigerator (wrapped in foil or plastic wrap) until ready to serve. 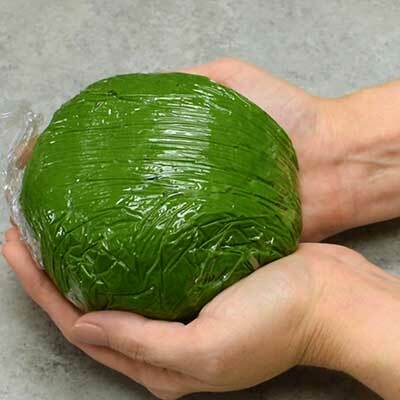 This cheese ball can be stored in the refrigerator for up to two to three days. Can you freeze a dessert cheese ball? Yes, you totally can! BUT I would recommend freezing it before adding the sprinkles, as they are brittle and may be broken or destroyed. To freeze, just wrap the cheese ball in plastic wrap and store in the freezer. The cheese ball should remain good for one to two months. When ready to eat, just allow the cheese ball to thaw in the refrigerator overnight before decorating and serving. For preparing and storing a cheeseball, make sure you have some plastic wrap on hand. It makes a huge difference! 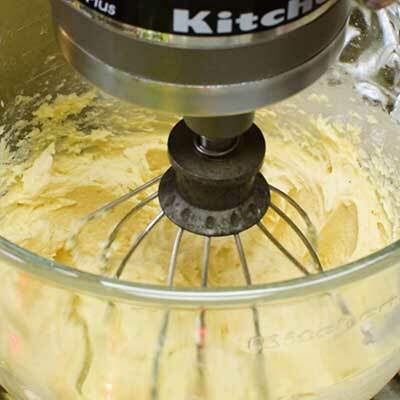 Step 1 – Using a stand mixer (or hand mixer + large bowl), add the cream cheese, butter, dry cake mix, powdered sugar, and brown sugar. Whip them together on medium-high speed until ultra creamy. 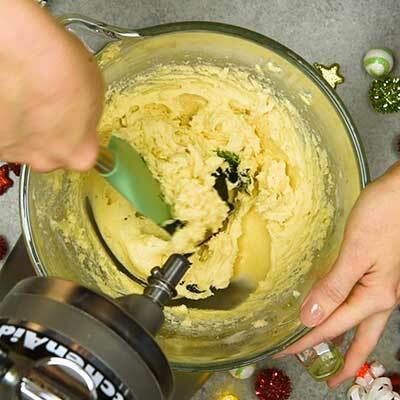 Step 2 – Turn off your mixer and grab a spatula. 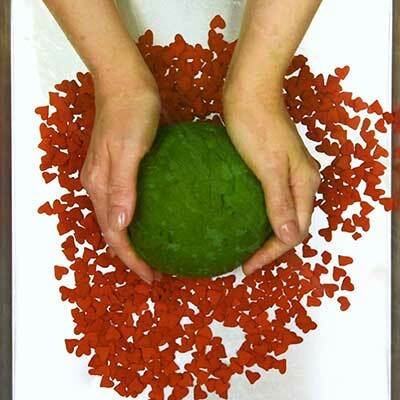 Add the green food coloring and gently fold it into the cheese ball mixture, making sure to scrape along the bottoms and sides. 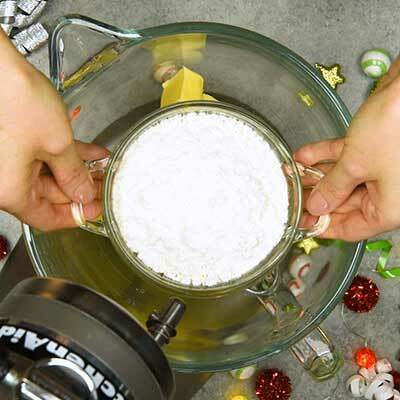 Step 3 – Lay out a piece of plastic wrap and scoop the cheese ball mixture into the center. 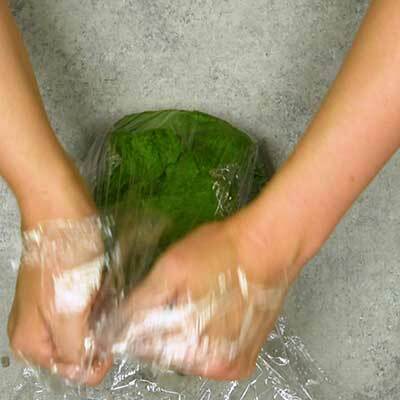 Lift up the sides of the plastic wrap and cover the cheese ball. 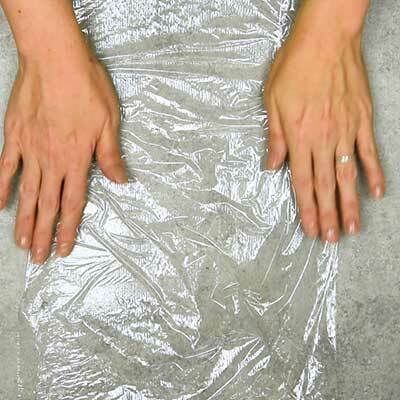 If needed, use a second piece of plastic wrap to secure all the edges. 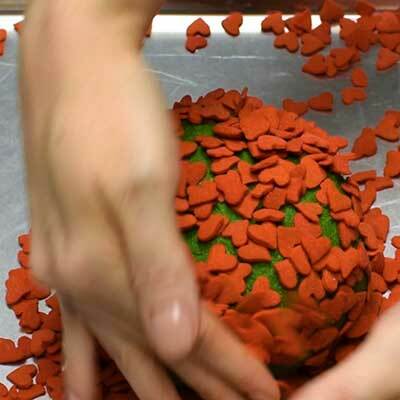 Step 5 – On a flat work area, spread out your heart-shaped sprinkles. 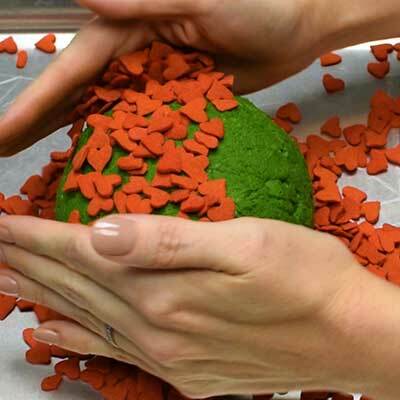 Unwrap the cheese ball and drop it in the sprinkles, then use your hands (or just roll it around) to cover the cheese ball in sprinkles. 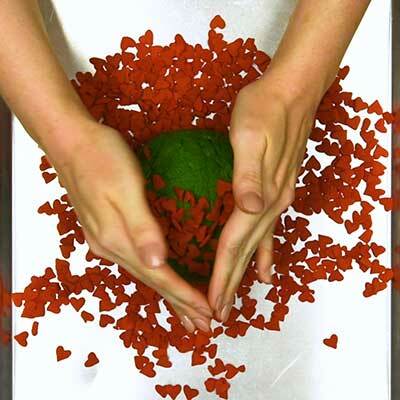 And since the hearts are a little wide, don’t be afraid to press them so they’re laying flat on the cheese ball. 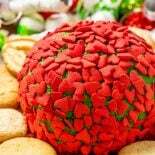 The flatter the hearts lay the better this cheese ball will look! Step 6 – Serve cheese ball immediately with a cheese knife and cookies (or pretzels or fruit) for dipping. 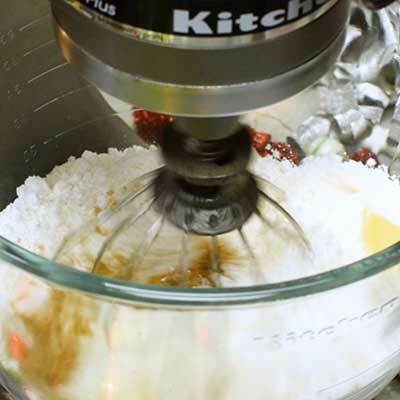 Using a stand mixer (or a hand mixer + large bowl), whip together cream cheese, butter, dry cake mix, powdered sugar, and brown sugar until smooth, about 3 to 5 minutes. 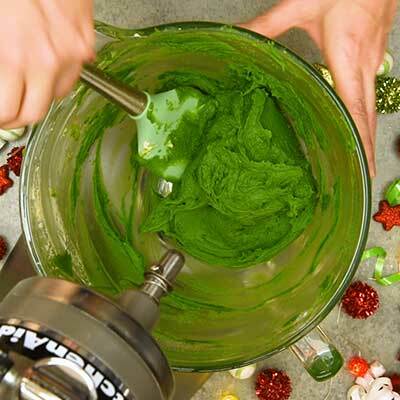 Turn off mixer and use a spatula to mix in green food coloring. 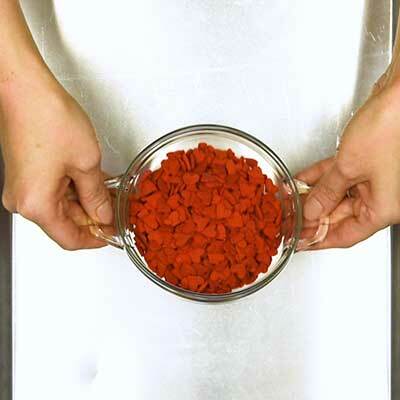 I used about 1 teaspoon, but feel free to use whatever amount gives you the color you'd like. 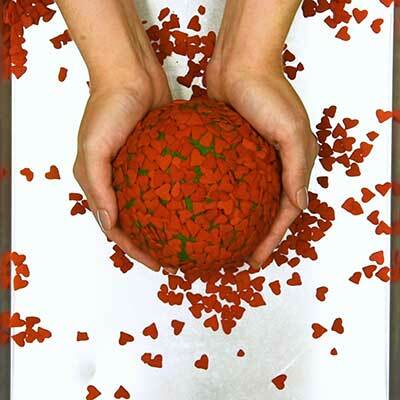 When ready to serve, spread out heart shaped sprinkles on a flat surface. 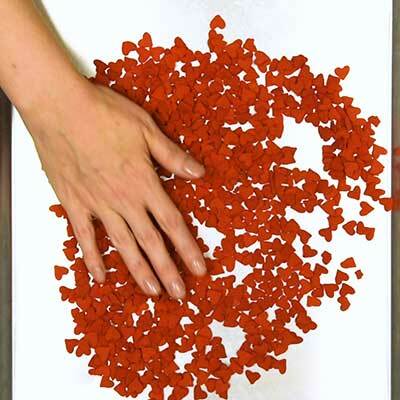 Roll the cheese ball in sprinkles, using your fingers to press and stick the sprinkles to the surface. 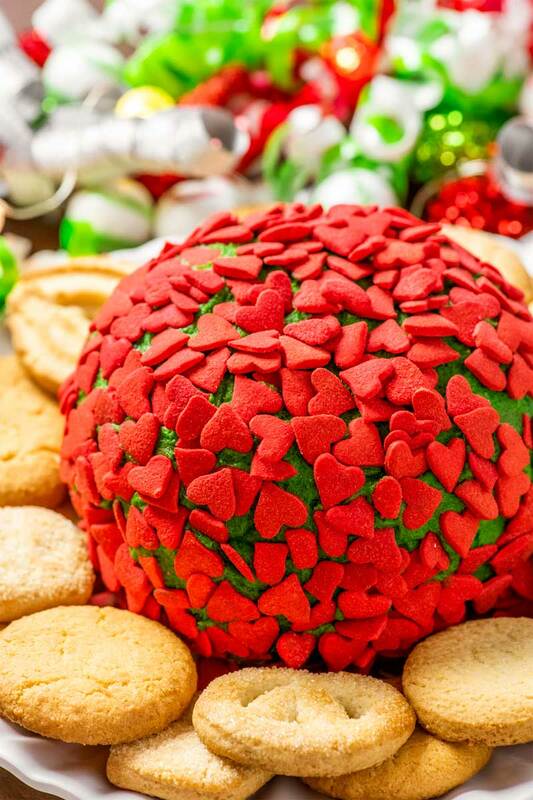 Serve grinch cheese ball immediately with shortbread or sugar cookies for dipping.